This Page is intended to give a VERY brief introduction to the Japanese culture and how it differs from that of the US. Hosts and delegates alike understand that standards of politeness are cultural, and that the cultures are different. This is what makes the visits so interesting. However, to ensure we don't accidentally offend our Japanese friends, This page includes tips on important cultural differences, and links to YouTube videos by westerners that have lived in Japan for extended periods and who wish to share their understanding of the Japanese culture. This page also includes a list of Things you would not expect to be rude, but are. It would be difficult to identify two countries whose history and culture differ as greatly as do Japan and the US. For hundreds of years, long before the Unites States was founded and even before the Europeans discovered the Western Hemisphere, the Japanese people refined their culture and their language within the limits of the islands of Japan. Weapons were and are illegal for normal citizens. In contrast, the immigrants to North America established the United States along the eastern seaboard of what was - from their perspective - an open and empty content. Through a series of purchases and wars, the United States expanded to many times its original footprint in a short span of 250 years (approximately). Signifanct among the immigrants were seekers-of-fortune and those desperate to flee their homeland due to poverty or religious persecution. Weapons were essential for food and protection, and their possession enshrined in our Constitution. If the watchword in the United States is "LIberty", then the watchword in Japan is "Harmony": harmony with the group, harmony with one's neighbors, harmony with the other citizens of Japan. 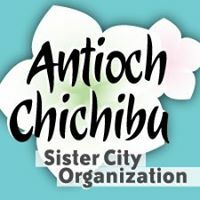 As members of the Antioch-Chichibu Sister City Organization, we want to be aware of these cultural differences, and to be in harmony with our Japanese friends. Please view this important YouTube video. This YouTube video is also useful. Host family members, and members of the Antioch-Chichibu Sister City Program in Chichibu, are familiar with American customs and behavior, and may behave more "American" when around us. However, when meeting a Japanese person for the first time, it is important not to allow our enthusiasm to allow us appear rude. Bow from the waist. Do not offer to shake hands; a Japanese person may not know how to respond. Yes, you may be excited to be in Japan, but let's restrain ourselves, be aware of the attitude and atmosphere around us. Japanese are polite and courteous. The Japanese mode of communication is based on listening more than talking, so in new situations, a Japanese person may seem quiet and shy, and may not take the initiative in introducing themselves outside of a group environment. The visiting American, recognizing the difference in communication styles, will be more appreciated if they begin by listening. Silence is not "awkward" among the Japanese, but an essential part of the conversation, of harmony. >> Addressing Members of your Host Family and Others. Always address your hosts including the honorific "san". "Myoko-san", "Yuri-san". Indirectness and implication is the Japanese way. Your hosts will most likely give you information about the do's and don'ts of life in Japan and in their home, but they will usually deliver it so gently that you may not recognize instructions. You may receive compliments while in Japan. Sometimes the compliments are offered in true acknowledgement of an excellent performance or situation. Often the compliment is offered in politeness. Compliments on how well we speak a few words in Japanese are among such politeness. Regardless of the motivation or of the compliment, compliments should always be deflected. "You speak Japanese very well" should be answered with, "Thank you, but I know only a few words, and speak them poorly." Please view this useful YouTube link on this subject. In the US, it is common for us to express our unhappiness or frustration to our fellows, especially if it is in the context of a shared experience. "Boy this line is long, I wish someone would do something about this." "Yeah, this is ridiculous! How about those Giants?". Such sharing of common frustration increases the bond between those that share that common experience. Japanese people rarely express unhappiness. Sharing unhappiness or frustration will make their friends and neighbors unhappy and frustrated, which does not reinforce the harmony of the group. Rather, Japanese tend to refrain from discussing a situation which they may find unpleasant or frustrating. Compared to the US, Japan is a homogenous society. In Tokyo, we are a fairly common site. But even in other larger cities, Japanese do not have much contact with foreigners – “gaijin”. Due to their careful nature and lack of confidence in their English language skills, some Japanese may avoid contact with you. Others may be fascinated by you. 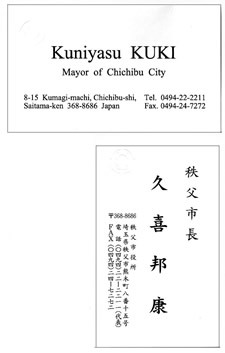 Social hierarchy remains an important feature of Japanese society, and will be important at City functions. One of the first questions a Japanese may ask is “How old are you?” in an attempt to establish this hierarchy. The sempai, or senior member, becomes like a mentor to the kowhai, or junior member, and are always addressed by their kowhai in a polite fashion. Although this structure may be different from what you are accustomed to in your home country, keep in mind that by assimilating into Japanese life and customs, you will begin to understand your hosts and their society. Gift-giving is an important part of Japanese culture and politeness. In Japan, much time and consideration (worry?) is given to what gifts to give, when, and to whom. Offer and receive gifts with both hands. Please also see this useful YouTube video on gift giving in Japan. An important part of Japanese culture is keeping the dirt/germs from one area separate from another, most evident in the customs regarding footwear. Among other reasons. much work and other activities occur on the floor of Japanese homes. It is therefore important that the floor be kept clean. The issue is not so much that your shoes are dirty, but that you walk with them on dirty surfaces outside the home. For our purpose, it may be useful to imagine that the ground and sidewalks outside the house is contaminated with sewage. The bathroom floor is considered similarly contaminated. We would never want to track such contamination into our hosts' houses. Your hosts may present you with slippers to use in the home. Show appreciation of the gift. But also, ask if it is OK to go barefoot, if that is what you prefer. There will be a pair for use in the toilet. Use them in the toilet. The Japanese understand that shoe customs in the United States do not include different shoes for different parts of the house, so they will be happy to explain the proper procedure. FOLLOW THESE CUSTOMS. With that in mind: bring shoes that are comfortable and - if possible - easy to take off. Lace-up shoes will serve if the laces are tied loosely. The the clean inside surfaces of the house and dirty outside surfaces are separated by a step-up into the house. This occurs at the "GEN-kan"- perhaps referred to as a "mud room" in the US. Make sure your shoes don't go further than the entry room of the house. It is usually fairly obvious where this area starts and stops, and if nothing else there will usually be a collection of shoes or cubbies there to tip you off. When taking off your shoes, step immediately into the upper area. Do not step on the lower area before you step into the house. Look to see if there are cubbies nearby to store shoes/slippers while one set of footwear is in use. Some households may leave their shoes/slippers out when not in use, so follow your host's example. Do NOT wear your house slippers outside. One of our members relates his experience as guest of a well-to-do and somewhat traditional family in Japan. He was presented with three sets of slippers upon arrival: one for use in the house in general, one for use in the bedroom, one for use in the bathroom. These were stationed, along with those of the other members of the household, at the entrance to the house, bedroom, and bathroom. Back up to the small step that separates the dirty outside surface from the clean inside surface. Loosen your laces if needed. Then loosen the shoes on your feet, using only your feet, one shoe at a time. If there is a bench to sit on, so much the better. Step backwards to put the heels of your shoes against the vertical surface that separates the genkan from the rest of the house. Slip out of your shoes and step up onto the clean surface. Rearrange your shoes if needed using your hands, placing them so that you can easily step into your shoes when it is time to depart. Touch the bottom of your shoes with your hands. Use the corner of the short step to pry your shoe from your foot. This brings your dirty shoes too close to the clean surface. Use your own shoes, one-by-one. Step out of your shoes onto the dirty surface, then onto the clean surface. Rearrange your shoes with your feet. 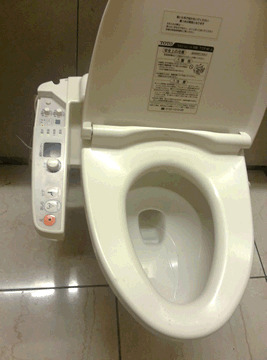 Japanese distinguish between the "bathroom" in which one takes a bath, and the "toilet", where one eliminates waste. Toilets are kept separate from the rest of the house by a designated pair of slippers everyone shares. These stay in the toilet area. Look for toilet slippers waiting for you in the toilet area. Switch slippers as you enter and exit the toilet. Do NOT wear your house slippers in the toilet or the toilet slippers outside the toilet. If there isn't a pair of slippers for the bathroom, then ask your hosts how you should proceed. Bare feet or socks ONLY on tatami. No slippers (and obviously no shoes). 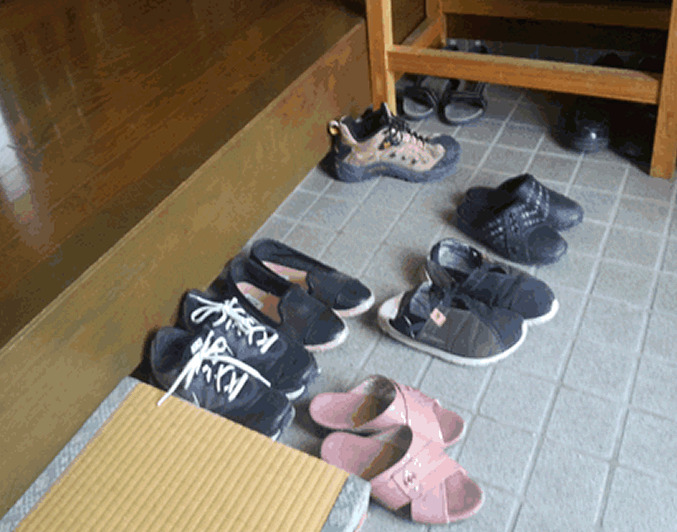 Leave slippers outside the door to the tatami room. If you are wearing sandals outside, your feet will get dirty. Carry a clean pair of socks with you and change into them if you enter a home or “fancy” place. 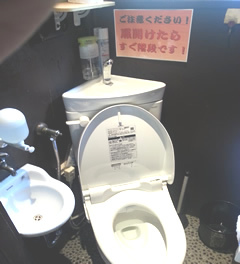 This is a toilet apparently retrofitted into an older restaurant. Hand washing facilities are located near the commode. Usually, hand washing is separated from the commode or urinal by a closed door. Note the faucet above the commode tank, and that the lid of the commode tank is a small sink. This allows the washing of hands with clean water as it fills the flush tank, and the flush to use "gray" water. 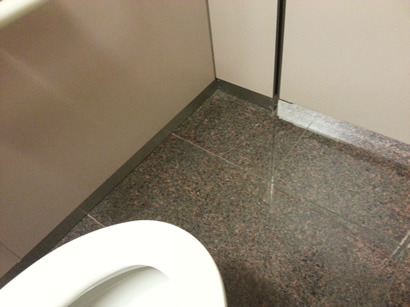 Walls in public toilets extend from ceiling to floor, and the door extends close to the floor. This provides maximum noise and odor insulation. The bathroom is where on bathes. See the discussion of bathing practices in the host's homes on the "Be a Delegate" page. Communal Bathing and the Use of the "Small Towel"
The Japanese enjoy bathing together, generally men with men, women with women. The Japanese hosts are aware that this is not a common practice in the US, however, as good hosts, they may offer the use of such facilities during the delegate's stay. Declining the use of these communal bath facilities will not be considered rude. For those that may consider using the public bathing facilities, note that the bathing include certain modesty procedures that may ease one's discomfort. Such procedures include facing the wall while washing and the use of a small modesty towel. A tattoo of any size may exclude you from a public communal bath due to the association between tattoos and organized crime (yakusa). This prohibition may be relaxed for delegates. The following links provide more information on this subject. The following actions are considered rude in Japan, although they are common in the US. Please also view the YouTube video links on this page for other information regarding behavior in Japan. Blow one's nose in public. No doubt this is due to the abundance of germs released by such an action. This is also why one will see Japanese people "sniffing back" to avoid blowing their nose. Do. Not. Blow. Your. Nose. In. Public. Ever. Say "bless you" or "gesundheit" when a Japanese person sneezes in public. Japanese are embarrassed to sneeze in public, therefore calling attention to this embarrassing action is not useful to our Japanese friends. 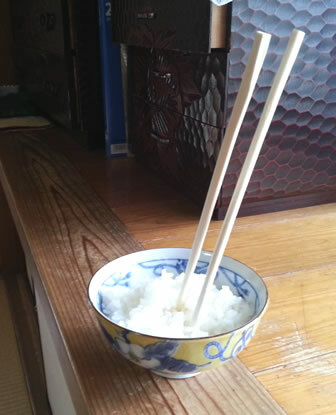 Sticking chopsticks vertical in rice. 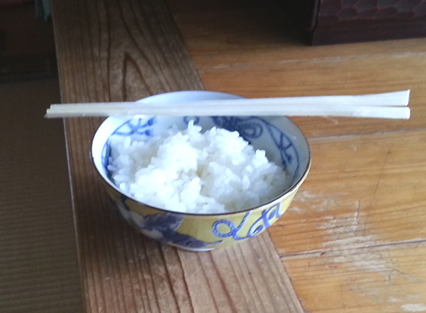 Passing food using chopsticks.This action is reserved for memorial ceremonies in which the bones of the cremated is passed from family member to family member, directly from chopsticks to chopsticks. Instead, if you wish to pass a small portion of food, place it on a small dish, and pass the dish. Other actions as described in the YouTube videos linked on this page. Use the word "anata" when addressing a Japanese person. Our translators give us this as a translation of "you". It is a term reserved for very intimate friends, possibly equivalent to "cutie-pie". Instead, use their name followed by "san". Example: to ask Yuri if she is hungry. say: "is Yuri-san hungry?" rather than "are you hungry?" Yes, we will slip on this, but we will do our best. This placement of chopsticks is only used in religious ceremonies. This is the proper placement of chopsticks. Business cards are VERY important to the Japanese business person. The presentation of business cards is a ritual among business people, and you may be offered a business card by one or more of the delegates (if you are a host) or by those you meet in Japan (if you are a delegate). If you are offered a business card, receive it with both hands. Inspect it, read it carefully immediately and in front of the person who has offered it, ask a question if you have one. Comment on the card. "Excellent color choices, I wish I could read Japanese." Note that family names, when written in English, are written in upper-case, to avoid confusion regarding the order of name listing. Put the card in your breast pocket or in a business card holder (Japanese carry these). Do NOT put it in your wallet, then in your back pocket. Transferring a person's business card to such a "dishonorable" location would be a serious insult in Japan. The following is intended to be a most introductory of introductions to the Japanese language. Each Japanese writing symbol represents a syllable rather than a single sound. This is different from English, German, and many other languages, which are “phonetic” languages in which each letter represents a sound, and a syllable is made from one or more of these symbols. In Japanese, generally each syllable has a single symbol. Japanese writing includes single symbols for combined consonant-and-vowel syllables, such as “kah”, “kih”, “kuh”, keh”, and “ko”, but there is no symbol for the unvoiced “k” sound. Thank you. = Arigatoo gozaimas*. Do you speak English?= Eigo-o-hanashimas* ka? What's your name? = Onamae wa nandes* ka? How are you? = Ogenki des* ka? How much does that cost? = Kore wa ikura des* ka? Can you help me? = Tetsudatte itadakemas* ka? Where is the toilet? = Toile wa doko des* ka? Note that "ka?" indicates a question. * The Japanese verb "to be" in present tense (I am, you are, he/she/it is) is written "desu" in Romaji, reflecting the two Japanese symbols ("de" and "su") that make up this word. However, this is commonly pronounced "des". SImilarly, "gozaimasu" is pronounced "gozaimas". The phrases above apply the incorrect spelling to avoid confusion for those first attempting Japanese phrases. I have had enough, thanks = "Kek-ko des(u) (note the "long" consonant k-k. Pronounce each "k" separately. Pronouncing Japanese words is a problem for us because we put accents somewhere in every word, often on the second syllable. There must be an accented syllable in there somewhere, right? Wrong. The Japanese do not accent any syllable. However, the Japanese language has short and long vowels that are distinguished by holding the sound such as we might do when we accent a syllable. This can be confusing to our Japanese friends because the meaning of some words change with the change of short to long vowels. As previously noted, the word for "house is" "i" pronounced "ee", whereas the word for "good" is "ii" pronounced "eee". We are not used to putting the accent on the first syllable of a Multi-syllable word, but we will do our best. "Arigato-gozaimasu" (spoken as one word). One imagines that Japanese may make fun of our American accents and our attempts to speak Japanese by putting long vowels indiscriminately in Japanese phrasing. "AriGAHto goZAImasu". Japanese sentence structure is quite different from English, making it difficult for our translator bots. In English, the subject of a sentence, the direct object, and similar parts are shown by their position in the sentence and by punctuation. Possession is indicated by “’s ”, and questions are indicated by the positioning of the words in the sentence,and a question mark (?). Verbs can appear anywhere in the sentence, seemingly at whim. In Japanese, a question always ends with "ka? ", possession noted with "no", and the verb "to be" is always "des(u)". No doubt Japanese think of our writing system and sentence structure is cryptic, mysterious, and unnecessarily (possibly deliberately?) complicated, what with our habit of decorating our sentences with strange symbols such as commas, semi-colons, colons, apostrophes, hyphens, quotation marks, question marks and who knows what else. And no doubt our own second-graders would agree heartily with our Japanese friends. Translators and translator aps have difficulty translating between English and Japanese, possibly due to the difference in sentence structure. Short phrases are easier for the aps to translate than longer phrases. Therefore, always reverse-translate a phrase before using it. If the phrase makes the "round trip" successfully, then it is likely that the Japanese translation is what you intend. Even with our best efforts, nonsensical translations will occur. Establish with your guests (or hosts) the word for "nonsense", thus letting the other party know that the translation ap was not successful. Japanese sentence structure calls for the verb to be at the end of a sentence, which also occurs in the "passive voice" in English. Therefore, it is sometimes easier for the aps to translate from English to Japanese if the English is in passive voice. "The gift is given", rather than "I give this gift." For instance, during a recent visit, the Japanese host said "Mike and Monica will strike the bell" in Japanese into the translator. The translation read by the guests was "Microphone and monitor will hit the money". The Japanese language includes three writing systems: two syllabic systems (Katakana and Hiragana), and a system using Chinese symbols (Kanji). Foreign words, including names of visitors from outside Japan, are usually spelled "phonetically" in Katakana, but all three systems can be used in a single Japanese sentence. Click here for a short but interesting article about the origin and structure of Japanese writing. Note that English uses four writing systems to symbolize the same sounds. "Printing" includes upper case and lower case, which we happily blend in our sentences. We do not think of these as separate systems, but consider that “E” looks nothing like “e”, and “A” looks nothing like “a”, yet the upper case symbol carries the same sound as its lower case counterpart. Let us also remember that our “cursive” writing system has yet another two sets of symbols: upper and lower case. 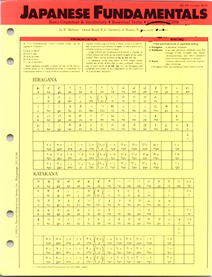 We learn printing in kindergarten, and cursive in elementary school, as the same system, but a new visitor from Japan would not recognize the upper-case "printed" symbol as equivalent to the much different-looking lower case cursive symbol.